Has it started to feel like fall to anyone else? A red maple leaf fell at my feet the other day, the nights are cool, there’s way less mosquitoes, longer shadows, and less weeding. Daytime has still been hot, hopefully there is more heat in store, cause the melons are just starting to roll out! Cantaloupe/muskmelons this week, likely watermelons next week. I hope everyone was eating caprese or brucheta last week, I know we were. You’ve got a second chance this week if you didn’t. It’s hard to imagine any better herb/veggie combo than tomato-basil-magic. In general, this is a great time of year to start preserving any excess produce. Corn is particularly easy to freeze. Simply cut the kernels off the ear with a knife and toss into quart bags–no blanching required. Pull out of the freezer at thanksgiving time or in February for a nostalgic treat. I made a tomato and couscous dish recently simmering lemon balm, carrots and onions for a broth to cook the couscous in. The lemon balm added a nice fresh overtone that went along well with the tomato and a little bit of curry spice mix–highly recommend it if you’re not going to make lemon balm tea. Cantaloupes are probably the most exciting item this week. Originally from Africa, they were first known to be cultivated by Egyptians, then by the Greeks and Romans and now by Minnesotans. If you’re looking to do something interesting, try grilling slices or pairing with prosciutto for a great salty sweet italian antipasta. For half shares who are getting Collards for the first time, Kevin posted a Brazilian collards recipe passed down from his mom on the recipe page several weeks ago that goes great with a little bit of fried pork or tofu. A little storage tip for the tomatoes, keeping them out of the fridge at room temp will retain their texture. Refrigerated tomatoes tend to become mealier, although they will keep longer. Also, a little reminder that the member potluck is happening in a week, Sunday the 4th of September. 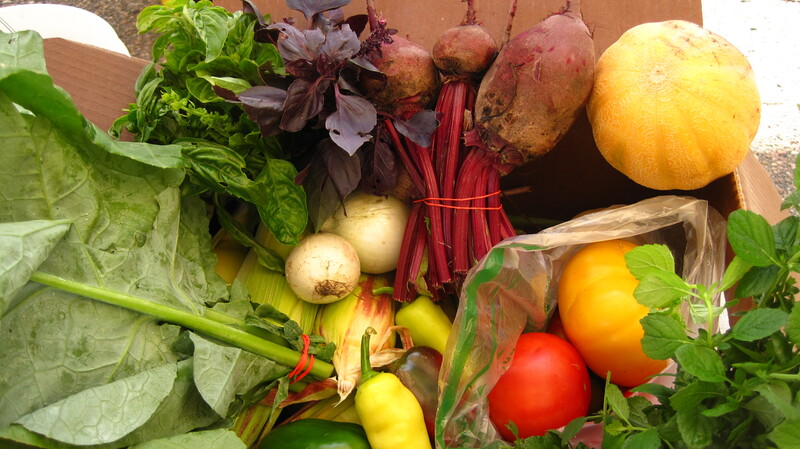 Come early to harvest your own box for the week, potluck starts at 4 and ends around 7pm. Hope to see you all there!